Automating temperature calibration has many advantages. For example, technicians need automation because they are under tremendous pressure to do more with limited resources, and automation can help reduce the number of repetitive time-consuming tasks required to complete a calibration. Managers need automation to improve the productivity of their workforce, to reduce the skills required to complete calibration tasks, and to ensure compliance with documented procedures every time. 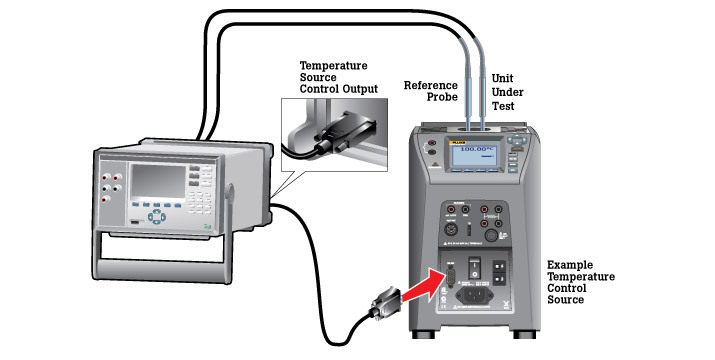 Automated calibration can be performed in the plant or shop without software when an instrument such as the Fluke 754 Documenting Process Calibrator or Fluke 1586A Precision Temperature Scanner is connected to a temperature source such as a Fluke dry-well or Micro-Bath. A degree of automation can also be achieved with Field Metrology Wells alone, as they can record data while running custom programs to a set of predetermined temperatures. In a laboratory or shop environment, calibration software may be used for more complicated calibrations that require multiple temperature sources or generation of calibration coefficients. Connect the calibrator to the temperature source with the appropriate data cable. Insert the temperature standard and probes to be tested into the precision temperature source (i.e. a dry-well). Connect the probes to be tested and the temperature standard to the calibrator, and enable the channels they are connected to. Select the test points and the order they are to be executed. Move on to another job or unrelated task. Return to collect and analyze your data.